A release date for The Crew 2 has been announced by Ubisoft along with various editions of the racer and a beta. The Crew 2 will be released on PC, PlayStation 4, and Xbox One on June 29. In the open world title, players will unlock a large selection of cars, motorcycles, boats, and planes to use across four different types of motorsport challenges. Challenges include street racing, off-roading, pro racing, and freestyle. Alongside the release date, Deluxe, Gold and Motor Editions of the game and a season pass were announced. Contents of the season pass were not provided as of press time. Customers who pre-order any edition of the game, including standard, will receive the Legendary Motors Pack as an incentive. It contains the 2016 Mercedes-AMG C 63 Touring Car, and the 2017 Harley-Davidson Iron 883. 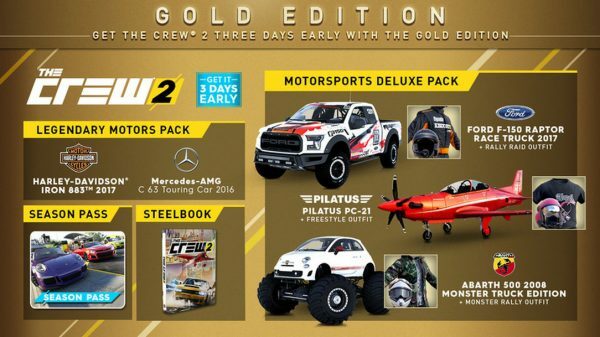 Those who pre-order the Deluxe, Gold, or Motor Editions will also receive the Motorsports Deluxe Pack which contains: the 2017 Ford F-150 Raptor Race Truck, 2008 Abarth 50 Monster Truck Edition, and the 2002 Pilatus PC-21 Air Race Edition Plane. 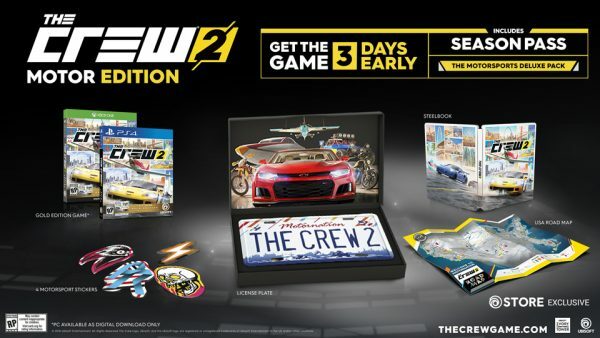 The Crew 2: SteelBook Gold Edition, including the Season Pass and a collectible SteelBook case. “A 25” x 20” fold out road map of the game – your guide to explore the entire USA, full of activities and hidden surprises. Four motorsport stickers – choose your own style between the 4 Motornation families. The Crew 2 Deluxe Edition ($69.99) contains Motorsports Deluxe Pack. Along with a release date and various editions for The Crew 2, Ubisoft also mentioned the game will support The Crew Rewards Program. The program features a series of monthly challenges in The Crew allowing players to unlock 19 unique vehicles in The Crew 2, including exclusive water vehicles. Finally, a beta for The Crew 2 will be held on PC, PS4 and Xbox One. More information on the tester will be provided at a later date, but you can sign up for it through the link. The Crew 2 was originally slated for a March 16 release.